This is a land of warring faiths and burning wills. Once the Moors ruled almost all, but now the Christian kingdoms push them ever further south. Great universities die and glorious kingdoms rise. And behind it all, in the deepest of shadows, we Cainites lurk. Blood calls to blood and vengeance will be ours. 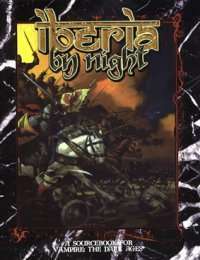 Iberia by Night is a complete sourcebook for medieval Spain, including both Christian and Moorish kingdoms. The history, cities and people are all covered in detail, as is the course of the bloody Reconquista that reshapes the land. Details on the vampiric princes and sultans of the land, the shadowy Amici Noctis manipulating Clan Lasombra, and on the other forces of the Iberian night give you enough for many stories indeed.